TALE OF TALES forum ~ View topic - Save the Forest! < Endless Forest News ~ Save the Forest! 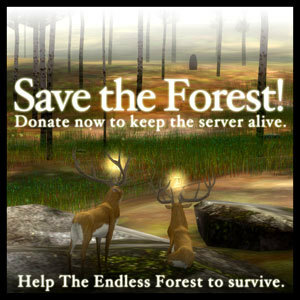 Mudam is ending its support for The Endless Forest, after having hosted the game server for 7 years. The Musée d'Art moderne Grand-Duc Jean in Luxembourg commissioned us to make a work of art for their online gallery in 2003. In response, we created the original prototype for The Endless Forest. In 2005 we were ready to launch the first iteration of the game and Mudam agreed to pay for the server required for allowing all players to interact with each other. Thanks to their support, The Endless Forest has been available for free until today. Now, however, the museum has changed its policies and is no longer willing to sustain the cost. Even though we haven't been updating The Endless Forest as much as we may have wanted to, and even though we can't promise any changes in the foreseeable future, we do want to continue to maintain the game in its current state and offer it to the public as a place of peace and harmony, free of charge. To do that, we will need to find a way to pay for the server. The monthly cost of hosting the server is 165 Euros. This is not a lot of money. And we already have a voluntary subscription system in place. All we need is a few more people who are willing to commit to sending us a few Euros every month. And then we can continue as before. This is not just a question of finances. It is also a matter of principle. We believe that an artist and their audience can have a symbiotic relationship that does not require any interference from the outside. So in a way, we are taking this opportunity to prove a point. Please help us do so. Select a subscription amount below to make an automatic monthly donation via Paypal. So TEF is now in the hands of the fans! What about this website and the community site? Are these on their server too? The website and the community site are hosted by the same company but on a different computer. It's a completely separate package that Tale of Tales is paying for. The Endless Forest server is an actual physical computer, dedicated to running the server of the game and nothing else. In for 3 euros a month! Would be more if I weren't a flat busted student. Come on people, let's keep the dream alive! Thank you. Keep spreading the word. We're not there yet. We're keeping track of the subscriptions on http://www.endlessforest.org/community/save-forest. I'll keep donating my monthly 10 euros! hey, i'm fine with having to pay for tef as long as it gets updated periodically and ssurvives!